This week at CVS, The Fragrance Collection by Glade 3-wick candles and reed diffusers (great stocking stuffers!) are 6.99 and earn back the full 6.99 in ECBs. Go here to sign up and print a coupon for 2.00 off. You'll pay 4.99 + tax and earn back 6.99 in ECBs, which you can use on just about anything in the store. Or, if you have 6.99 in ECBs, purchase another $2 item and pay with the 6.99 ECB. You'll end up just paying tax for two items. 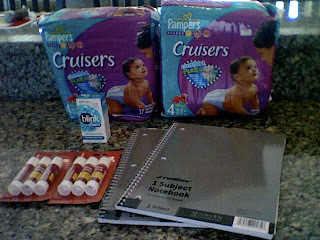 I bought a pack of Pampers (on sale for 9.99, used a 1.00/1) and a candle. I used a 3.00/1 from All You magazine, paid with a random assortment of ECBs and ended up paying around 1.04 I think out of pocket. Plus I got that 6.99 back. Also, don't forget to scan your CVS card at the little coupon machines if your store has them. I got some really great coupons today, and remember that CVS permits you to use one CVS coupon AND one manufacturer's coupon per item for even greater savings. The Grocery Game. And Whole Foods, friends. Now on to what will probably be my only shopping trip for the week, minus tomorrow's produce delivery which I'll get to momentarily. Also got a .30 bag refund. Schwan's is doing a promo for $10 off any order. If you pick an item under $10 there's no delivery fee. no tip. no taxes. totally free--and, i figured, no worse for the environment since the truck is always in my neighborhood anyway. I haven't tried this yet, but it was free since the cost of the item was under $10--new customers only and there's lots to choose from. If you don't want to subscribe to their service just ask them to add you to their "will call" list. My delivery man was totally nice--and I've always heard wonderful things about their treat/desserts (which is why i chose a frozen veggie dish--I have no willpower if goodies are in my house). Starting the week with a bang. I haven't been posting my shopping trips as much here lately and I'm sorry for sucking in that department. Honestly, I haven't found too many great deals worth sharing. So I've just been plugging away, grabbing the deals when I see 'em but mostly just buying fresh produce. 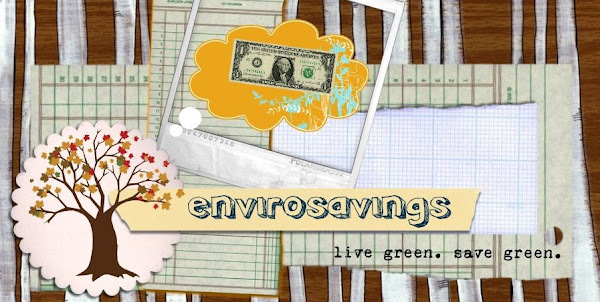 I did a bit of Whole Foods shopping last week, and when I was checking out I ran into an Envirosavings reader. (Hi, Shannon!) Well, actually she's my husband's co-worker but she said she reads here so I pretended I was cool for a second. I used the $5/$25 that Jess mentioned, and paid with just under 17 ECBs. Paid 10.50 oop and got back 21.99 in ECBs. That's like paying 5.25 per pack of diapers and getting everything else for free. Total score. 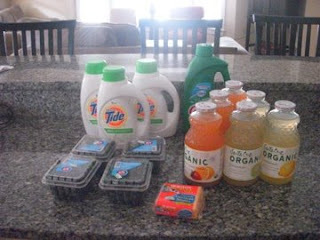 $4 came off my total for the Buy 4, Get $4 off P&G promo, which made the Tide 3.88 each and the Cascade 1.99. 30 snickers @ $1 for 2 = $15--total = $33 plus tax. pay with 5/25, 15 x $1/2 snickers Q, 2 X $1.50/1 huggies Q = $ 10 OOP (will pay with ECBs, get back $9 in ECBs---$5 from the candy and $4 from the huggies) --not too early to start getting ready for halloween either! Other options to combine with the huggies and the 5/25 include the contour meter if you have a Q to get another MM, Revlon Colorstay mineral Mousse makeup ($1MM after insert Q and ECBs)--thanks to iheartcvs for the headsup on the ad! broke into 4 transactions. paid with a 5/25, 4/20, 4/20 and $3 soliel Q from today's paper, $3 neutrogena Q, $3 worth of huggies mannys, $2 Huggies CVS Q, $1 Revlon Qs, $60 in candy Qs and tons of ECBs. Paid $3.50 OOP total for all 4 transactions (on a gift card actually) and have more ECBs than when I started ($28). The candy is in a box taped closed and hidden by my husband and the receipts are with them, so I can't get into the specifics, but the OOP was just over $3 for sure. They are designated for fundraising for his school. To be honest, I paid $20 for the candy coupons, so even adding that in, it's a great deal, but I would never have any need for 120 candy bars, but they sure made the $/$$ Qs useful today. I had big plans to begin potty-learning with my youngest. She's started telling me when she needs to go poopy so I figured I'd put the little potty in the living room and keep asking. So far she sits on the potty without incident. She makes a grunting noise, asks for her diaper back on and promptly poops in it. So we aren't quite there. Pampers are 2/$20 and when you buy 2 you'll earn back 5 ECBs. 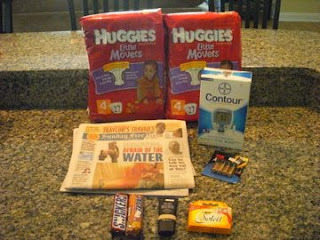 Use 1.00/1 coupons from today's P&G insert. Some areas had this same coupon insert in their weekly Red Plum mailer also. Additionally, Blink eye drops are 7.99 and earning back 7.99 in ECBs, making them free. There is a 3.00/1 coupon in today's paper which will give you $3 overage. Also use 13 ECBs if you've got 'em. You'll spend 5.99 + tax and earn back 12.99 ECBs. That's just $3 per jumbo pack of diapers! Also be on the lookout for CVS Baby Club coupons all over CVS. When you enroll in CVS's baby club you'll earn 10 ECBs for every $100 you spend on diapers and wipes.